A new report by a national committee of U.S. industry and university leaders details 16 recommendations "aimed at reinventing manufacturing in a way that ensures U.S. competitiveness, feeds into the nation's innovation economy, and invigorates the domestic manufacturing base." The report was prepared by the 18-member steering committee of the Advanced Manufacturing Partnership (AMP) that was launched by President Obama in June 2011 and co-chaired by Susan Hockfield, now president emerita of the Massachusetts Institute of Technology, and Andrew Liveris, president, chairman and chief executive officer of The Dow Chemical Company. The AMP Steering Committee Report to the President on Capturing Competitive Advantage in Advanced Manufacturing was formally adopted by the President's Council of Advisors on Science and Technology. 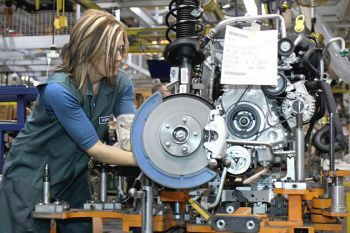 The recommendations include a call to establish a national network of manufacturing innovation institutes; an emphasis on investment in community college training of the advanced manufacturing workforce; an approach to evaluate platform manufacturing technologies for collaborative investment; a plan to reinvigorate the image of manufacturing in America; and proposals for trade, tax, regulatory, and energy policies that would level the global playing field for domestic manufacturers. The Administration has already begun taking action on strong-consensus recommendations, many of them consistent with those put forward by a wide range of other experts and organizations. For example, an interagency Advanced Manufacturing National Program Office (AMNPO) has been established to coordinate federal manufacturing resources and programs and to foster the creation of private-public partnerships focused on manufacturing innovation. The new office, which is hosted by the National Institute of Standards and Technology, is acting on the AMP Steering Committee recommendation to establish a national network of manufacturing innovation institutes. In his budget for fiscal year 2013, President Obama proposed a one-time, $1 billion investment to build the National Network for Manufacturing Innovation, consisting of up to 15 regional innovation institutes. Through regional workshops and other means, the AMNPO is now gathering public input on the design of the proposed network. A key goal of the envisioned network is to close the gap between U.S. research-and-development (R&D) efforts and the scale-up of R&D-spawned technological innovations in domestic production of goods.